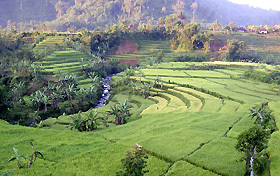 In February 2004 the agreement for the Bogor Field Station (BFS) was signed and an office was set up on the campus of Bogor Agricultural University, complete with office space, meeting room, and laboratory. In December 2004 a one-year extension of the rental lease was agreed to. While there is ample space and facilities, the development of the office equipment and laboratory has been behind schedule. And the office, being located in Dalmarga, some distance from Bogor itself, is not used much. It is there to be used not only by students and faculty members of ASAFAS and CSEAS, but by students and faculty members of other Japanese universities as well, so please make use of it. Furthermore, it is close to CIFOR (Center for International Forestry Research), with which we have signed an MOU, and which has a collection of materials and information on forests throughout the world. This center can also be used. With respect to plants, LIPI's "herbarium"is in the center of Bogor. We are also conducting joint research with this institution, and mutual use of the three institutions is convenient for field research. In future, as we find ways to work with these three institutions, we would like to broaden the field station's activities as a place for exchange of research and information. 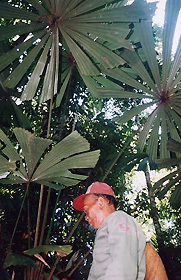 With a Penan Informant in East Kalimantan, Licuala sp. Two graduate students were sent by the 21st Century COE Program in FY2004. Retno Kusmaningtyas (enrolled in FY2002) went to Tesso Nilo, Riau Province, Sumatra, Indonesia for two months, August and September 2004.to research the theme "Management of National Park Integrated with Surrounding Social System; Study in Tesso Nilo, Riau Province, Sumatra, Indonesia." She researched the relationship between preservation of the natural ecosystem among residents in the vicinity of Tesso Nilo National Park, established in 2004, and the local economy. In terms of the relationship between the felling company, the artificial forest, oil palm cultivation and the settlement villages (Lubuk kembang bunga Village: 521 households, Air hitum Village: 260 households) approximately 60% of the residents are engaged in timber felling labor. There seemed to be the conflict with preservation of the ecosystem. 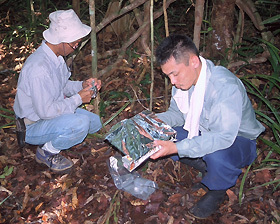 From June 15, 2004 to January 2, 2005, KOIZIMI Miyako (enrolled in FY2001) collected folk knowledge about plants of the Penan Belalui and evidence samples in Malinau, Longpujyungan, Longbelaka villages in East Kalimantan, Indonesia for Ethnobotany of the Penan Benalui hunter-gatherers of Borneo. The results of this collecting of folk knowledge showed that the plant classification of the Penan Benalui is more detailed than that of the hunters-gatherers studied hitherto, and the number of plants they utilize is abundant. Her thesis related these features to the background of these people as hunter-gatherers in a rain forest. 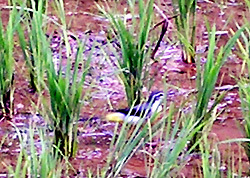 KATAOKA Miwa (enrolled in FY2003) studied "The mutual relationship of bird species and residents' occupations: a study in rural mountain villages in West Java, Indonesia" in three farming villages characterized by occupational activities in the area around the Halimun-Salak National Park in the province of West Java in Indonesia. 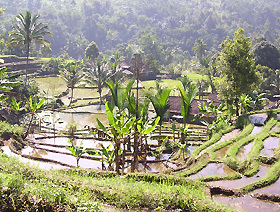 The rural villages' environment was classified into six environment elements based on the residents' land use: paddy fields, mixed farm/forest land, grassland/bush land, fields, tea plantations and forests. She conducted a census of bird species in these various environment elements from March to September 2004, recording species names, population and behavior. 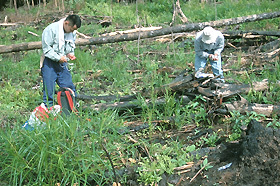 KOBAYASHI Shigeo (ASAFAS faculty member) UBUKATA Fumikazu (ASAFAS JSPS research fellow), SHIMAMURA Tetsuya (Faculty of Agriculture, Kyoto University), FUJIMOTO Kiyoshi (Nanzan University) surveyed the impact of land use conversion of tropical peat forest on decomposition of peat in Tuluk Meranti, Riau Province, Sumatra, Indonesia in connection with the Ministry of Environment's "Land Resource Management Options to Control Global Warming in Southeast Asian Swampland" project. 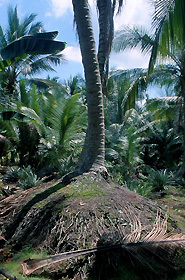 Lands surveyed were peat swamp forests, rubber plantations, slash-and-burn fields, coconut groves, pineapple fields and mangrove forests. 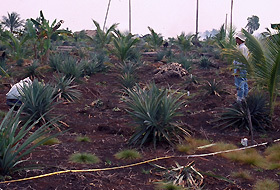 FURUKAWA Hisao (Kyoto University professor emeritus), HIRAMATSU Kozo (ASAFAS faculty member), and TAKEDA Shinya (ASAFAS faculty member) went to Jambi Province on Sumatra in Indonesia and conducted experiments to neutralize the soil in sulfuric acid acidified peat fields by sulfuric acid removal under the Ministry of Environment's "Land Resource Management Options to Control Global Warming in Southeast Asian Swampland" project. SUGISHIMA Takashi (ASAFAS faculty member) and ABE Kenichi (National Museum of Ethnology faculty member) visited CIFOR for "Research on Human Security of People Living with the Forest" with the scientific research fund. As well as collecting materials, they studied the history and present situation of coffee cultivation in East Timor.